This is a guest post written by Todd Wenning, CFA, who is an equity research analyst. Todd is the author of Keeping Your Dividend Edge: Strategies for Growing & Protecting Your Dividends. The opinions expressed here and in the book are those of the author and not those of his employer. In July 2008, just as the financial crisis was picking up steam, I bought some shares of the pharmaceutical giant, Pfizer. At the time, Pfizer had a trailing dividend yield of 6.9%. I thought this was a slam dunk investment. After all, Pfizer had increased its dividend for over 40 consecutive years, had recently boosted its payout by 10%, had a AAA-rated balance sheet, and was in a defensive industry that should, it seemed, hold up relatively well in a poor economy. [i] Even with Pfizer facing generic competition and slowing sales, declining dividend coverage, and a well-above average dividend yield, it seemed Pfizer was well-positioned to withstand some short term turbulence. Source: Company filings, Author calculations. I nearly spit out the water I’d just sipped. Pfizer?! My friend must have been mistaken. Alas, he was not. While announcing a massive $68 billion acquisition of fellow drug giant, Wyeth, Pfizer’s board said it was cutting its once-sacred dividend in half. [ii] The capital markets were tight during the financial crisis, but Pfizer, backed by its near-perfect credit rating, nevertheless raised the debt it needed to help fund the stock and cash deal. Clearly it wasn’t a funding issue. So, why the need for the dividend cut? The answer might be found in the press release for the acquisition, which mentioned the dividend remained “competitive with other industry participants.”[iii] In other words, Pfizer’s board wasn’t happy that its yield was much higher than its peers – for most of 2008, Pfizer’s yield ranged between 1-2 percentage points above most of its competitors. I think the board saw the acquisition and the numerous dividend cuts occurring elsewhere at the time as an opportunity to reduce its payout. 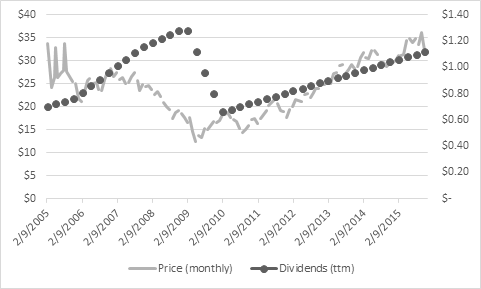 As of this writing six years later, Pfizer’s dividend has yet to fully recover from its pre-cut levels. · Beware of “transformation” stories: Going back as far as Pfizer’s 2005 annual report, the company often spoke of the need to transform the business in the face of patent expirations, the need for cost reductions, and replenishing the drug pipeline. [iv] In 2008, restructuring costs were on the rise, reaching $2.68 billion (5.5% of sales) that year, up from $1.3 billion spent in each of the previous two years. [v] My rule of thumb is that a company gets one year to transform itself – if the transformation stretches into multiple years, the company is likely struggling to gain traction in its new strategy. A dividend cut could be on the table. · Be mindful of competitors’ dividends: Companies’ boards don’t operate in vacuums and most monitor their competitors’ dividend policies as a guidepost for their own. Buffett calls this the “institutional imperative” and noted in the Berkshire Hathaway 1989 annual report that “the behavior of peer companies, whether they are expanding, acquiring, setting executive compensation or whatever, will be mindlessly imitated (by institutions).”[vi] If a company’s dividend yield is well above its peer group average or if peers are cutting their dividends, the board may be more inclined to follow suit. · Don’t depend on dividend track record: Prior to the dividend cut, Pfizer had one of the most dependable dividend track records in the S&P 500. Yet when it came down to it and the board changed its strategy, the dividend was unceremoniously slashed. A long history of increasing dividends is a positive signal, of course, but shouldn’t be a major factor when there are other red flags present. · Shrinking sales have rippling effects: Revenues are a company’s lifeblood and are at the top of a company’s income statement for good reason. If customers aren’t coming through the door, it doesn’t matter how efficiently you can produce the item or how progressive your dividend policy is. As such, when companies see demand falling for their products and they’re unable to offset it with price increases, they’re forced to reduce costs in order to maintain and grow profits and cash flows. If a company is unable or unwilling to reduce expenses or doesn’t see a recovery in demand in the near future, the board may be more inclined to reset investor expectations around the dividend. Sluggish sales could also lead the board to pursue a more aggressive M&A strategy to reignite growth, which could also result in a reevaluation of the dividend policy. The opinions expressed here and in the book are those of the author and not those of his employer.